Can WordPress Scale its Community Without Mentorship? WordPress is growing. It’s a tool used to build enterprise-level websites, not just cat blogs, and it is increasing its market share daily. I believe that a growing platform cannot scale unless the community that supports it also scales. How can a community scale unless there are mentorships both formal and informal? The WordPress community is amazing. The people in the community are generous, friendly, and accepting. Just go to any tech conference and I’m sure you’ll notice the difference between those events and WordCamps. Most local WordPress communities support meetups, too. These are great places to share knowledge, learn, and meet friends. There are Facebook Groups, Slack Channels, and many ways to collaborate on a global scale. Rapidly growing over the last thirteen years, WordPress as a tool, code base, and, yes, platform, has a firm foot in the early majority. But at what point will self-learning and organic friendships, need to scale? Or will they on their own? Has the premise that building websites is easy changed our idea of apprenticeship? Is mentorship on the decline? Can a community grow and sustain itself — and scale — without mentorship? For thousands of years, apprenticeship has been a bridge between education and employment. And today, we really call this internship when it’s outside of the traditionally-unionized trades. What is the difference between an apprentice and an intern? The only real difference is the view of white collar vs. blue collar work. Though rooted in past centuries, apprenticeships and internships are still used to gain valuable on-the-job or outside of the textbook training. In “How Great Leaders Inspire Action,” Simon Sinek discusses the law of Diffusion of Innovations with both social movements and technology — both of which apply to WordPress. WordPress now has a firm foothold in 25% of the market share. 2.5% of our population are innovators. So, that could be plugin and theme developers. The next group after innovators is the 13.5% or early adopters. This would include new devs, website builders, and end users who are excited to use a new product. 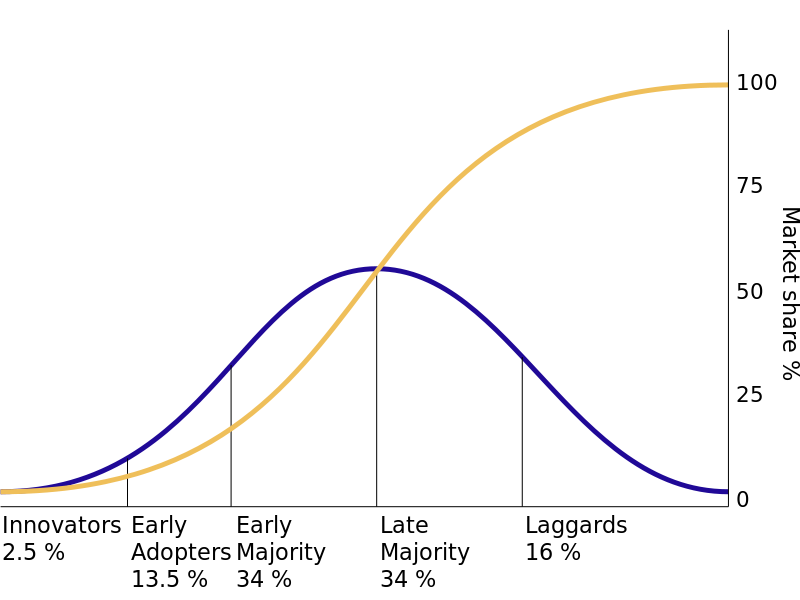 The diffusion of innovations according to Rogers. With successive groups of consumers adopting the new technology (shown in blue), its market share (yellow) will eventually reach the saturation level. Can WordPress continue to grow without individuals spending their time investing not only in the code (Core) but in people? 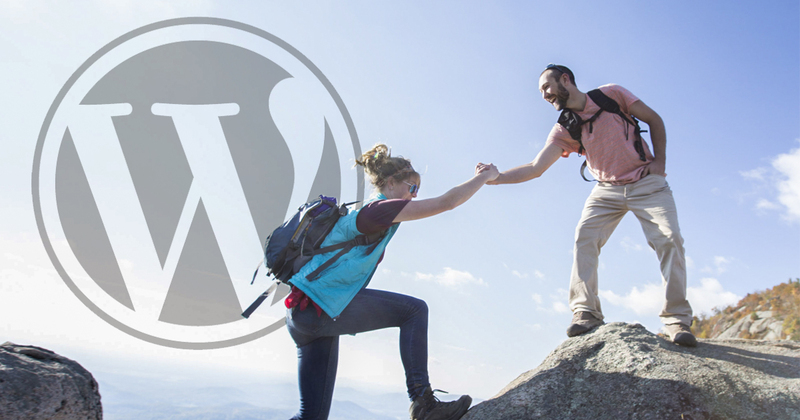 The WordPress Foundation does a lot as the community-focused nonprofit behind the WordPress Project. They have guidelines on meetups and WordCamps. They are even available on the WordPress app for support! How enthusiastically encouraging. But they are a relatively small team. What’s my point? It’s up to us. A few friends and I started a meetup called Women Who WP because we thought it would be fun to have dinner and talk WordPress. An unexpected surprise is that the ladies who attend our event also started attending the other meetups in our area and two even went to their first WordCamp this month. Recently at Wonder Women Tech, Jen Miller and I ran into Josepha Haden, Community Wrangler for Automattic, at the WordPress.com Booth. During the course of our conversation, and my fan-girling, we told her about our meetup. She was more than supportive and made sure we knew about the Foundation’s Meetup.com Chapter Program. It was reaffirming and we left totally encouraged to continue on mentoring our own group through friendship. In the “Stack Overflow Developer Survey,” Paul Krill notes their 2015 survey found “that 41.8 percent of respondents described themselves as ‘self-taught.’” In a survey where “92.1 percent of respondents were male,” you have to wonder if learning styles aren’t a disqualifier. This causes one to wonder: do we favor self-learning because we, ourselves, were self-taught? And how much of a percentage of our population can we reasonably expect to learn without human interaction? What is the power of questions? Questions have power. Questions fuel curiosity. Curiosity fuels the mind. An active mind seeks solutions, creates ides, communicates with passions. No new ideas or innovations occur without questions. So, as innovators and lovers of knowledge, we question. We seek. We explore. Exploration is a great thing. I’ve been exploring the topic of mentorship for the better part of a month. I wouldn’t worry about people who question too much; rather, I’d worry about the person who never questions. These people may be intellectually lazy, afraid of you, or have poor communication styles. That said, some of us have slower and deeper thinking styles. I may not question you immediately, but I’ll be back — on Slack, email, Twitter, in a meetup — I’m learning to not be afraid of how I look if I don’t already know the answer. I get, “just Google it” as a response. You need some give and take in any relationship. So, you can’t just show up at a WordPress meetup, say, with a list of ten questions on how to fix your website and expect people to answer all of those questions for free. That’s more appropriately answered in a paid consultation. In the WordPress community, where self-discovery is revered, it’s good to try to find answers yourself. And this is not a linear journey by any stretch of the imagination. And this non-linear journey can be a problem. Is Googling hurting our ability to think critically? It’s true that Google can answer a lot of questions right away. “What is a taxonomy?” “What is WordPress?” “When is Ghostbusters being shown in the theatre?” Spitting out answers is a good thing — when short answers solve our problem. In self-learning, we often have to do more than one search. We have to read more than one post, listen to more than one podcast, and watch more than one video on YouTube. How do we keep track of our learning and epic browser journeys? Start a Google Doc. Write down your question. Run your question in the search engine. Find results. Take quotes from the article and link and put those in your document. Now, when you go to the meetup and you’ve learned what a Custom Post Type is, you can ask a more detailed question such as, “What is the strategic advantage of a Custom Post Type?” You will get your answer, be respected, and help others in the room. This is a win-win. Mentorship isn’t about answers; it’s about the journey to the answer. So, if you want to learn PHP, take a class. If you want to learn CSS, take a class. There are many programming classes online (lynda.com, treehouse), personal consultants and trainers like Bob Dunn, as well as in-person training (Girl Develop It). Training should not be confused with mentorship. Mentorship is about helping you discover your goals, your path, your way. Mentorship is about helping you look in the mirror — honestly. As Jeff Turner pointed out in the Business Track at WordCamp Orange County recently, it’s about someone who will help you cut through your own B.S. If you’re not self-aware, you don’t know what you don’t know. Meta. Right? But it’s true. Also, Gary Vaynerchuk talks about self-awareness and the win — often. The strength of any community lies in its relationships. We end up going to our friends for answers. We trust the reviews from our peers. So these can be informal and formal mentorships. I’ve found several formal or more formal mentorship programs in the WordPress community. WPMentor, created by Matt Medeiros, is a site that will help pair up people who would like to mentor and be mentored. In this video, Matt follows up with one such pair. I recently chatted with Tonya Mork about mentorship as well. Her mentorship took on the form of an apprenticeship, which is also needed. I asked a few questions and she was gracious enough to answer. Q: Why did you decide to mentor? Q. How did you pair up? Q: How long was the relationship? Q: What is your advice for mentors? You can read more about Tonya in her HeroPress essay. Are formal mentorships the only kind? Of course not. We forget that people can have infrequent yet impactful interactions in our own lives. If we’re open to learning we can learn from anyone at anytime. It’s easy to take Meetups for granted or to believe that their only value is in the exchange of information. However, the value of in-person meetups cannot be understated. My theory is that most of WordPress mentorships are, in fact, informal and take the form of friendship. In Orange County, for example, we have several meetups to choose from which have become mini communities in and of themselves. By building relationships, a cohesive bond is formed. We generally call this friendship. Knowing that you’re not alone is the first step in friendship. The exchange of ideas — theme suggestions, the best form plugins, and CSS tricks — all help the meetup attendee with her work, but even more, the discussion is a platform upon which friendships are built. Friendships are the undergirding, supportive structure of any thriving community — like a coral reef. Am I the right person to mentor? You may feel, as an advanced user, that teaching beginners or encountering beginner topics are tedious. With the wrong perspective and, quite possibly, in the wrong context, it can be tedious. However, If you focus on the delivery of information, you’ll tire of the repetition. If you focus on the development of people, you’ll be energized. Can you imagine a math teacher complaining that teaching 6×6=36 gets old? If they do, they shouldn’t be a teacher. And, perhaps not everyone is in a position — mentally or physically — to teach others. Not everyone is gifted in the same way. Instead of dismissing people’s questions by referring them to Google, how about referring them to another resource — or better yet — person? Building up people makes you bigger. Building up people builds a community. Referring questions is not a bad thing, just like referring business. You still provided value. How Does Empathy Relate to Mentorship? Empathy is the key ingredient in any relationship and vital to an effective mentorship. We’ve agreed that a community consists of people with relationships — one to another. Not everyone who wants to learn is able to learn alone. Sometimes asking a question only to be handed off to Google is daunting. It’s discouraging. Do we empathize with the person learning a new thing for the first time? Google is a computer. It doesn’t teach you discernment. A new user doesn’t have the experience or wisdom to be able to decide which answer is correct. This is where mentorship comes in. A mentor can help you with your thinking process and correct errors in presumptions. But this can’t happen unless a conversation takes place. The people coming into WordPress these days are more than just programmers, designers, and developers. WordPress users now include writers, real estate brokers, small business owners, and social media marketers. The diversity of the background is amazing. But this is why empathy matters. During a conversation, context will give the mentor cues into how to relate this new concept. And when learning something new, context is everything. WordPress is Growing. Mentorships Matter. A growing platform and a growing community means that mentorship needs to be a priority. Does this mean it needs to come from the Foundation? Not necessarily. The Foundation does a great job mentoring WordCamp organizers already. They have an active Slack Channel and are actively helping people create meetups. This is an amazing effort. But I don’t think it’s the WordPress Foundation’s sole responsibility. How can companies, freelancers, and WordPress enthusiasts give back to continue the growth and scalability of WordPress? Should Five for the Future include mentorship as well as code commits? How are you giving back?